While cleaning out some random cabinets I came across more floor samples...I don't recall grabbing so many from Home Depot...but the evidence doesn't lie. This makes samples 4 and 5. The first three floor samples were turned into a key holder, click here to see. It was one of my favorite projects this year so I decided to repeat the magic. The kids had this fun zoo towel holder complete with personal art work. If you check out the tiger's nose you'll notice it fell off. The teal color ended up not getting used. After a "sloppy" coat of the Khaki Brown, both pieces were whitewashed. Letters stenciled in Chocolate Bar. Sealed with Polycrylic. The hooks were a Restore score. They were originally white. The nails and screws were placed all around to prevent the towel holder from moving. Can we call it an "industrial" look? 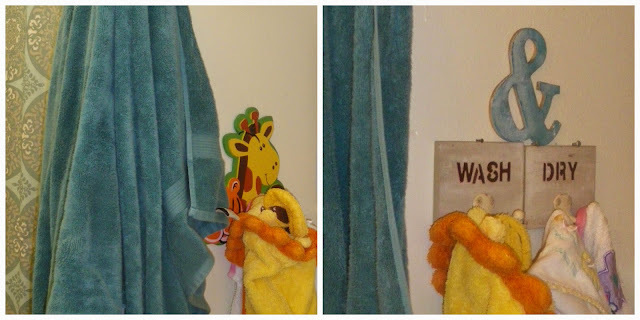 hahaha Seriously, my son has been known to hang from his towel...remember that missing nose on the tiger? Nothing in my stash of hangers looked secure enough for his boyish wiles. If the towel holder falls, its taking the drywall with it, lol. The amperstand was a wooden find from Walmart a while back. It was painted in turquoise, then whitewashed to soften the look. We've had this up for a good month now and I rather like the more "grown up" look in our bathroom. Its a far cry from being updated but its a step in the right direction. Adorable towel hanger, I bet the little ones love it.